In college, a summer retail job seemed like easy work with little commitment where I could punch in, punch out, earn some money, and spend the rest of my time doing what I loved. When it seemed like only retail jobs were available once I finally graduated with a degree, it quickly became apparent that I needed to find a way to make more money and earn a better position, fast. But where was I supposed to start? My liberal arts degree suddenly felt useless in the face of a jobless market. I searched tirelessly for positions in my skillset, found nothing that didn’t require a ton of prior experience, then went on the hunt for jobs outside of my skillset. Eventually, I realized getting a new job might not be possible, but making more money at my current one could be. Since I was working for an international retail chain that sold technology, it made sense to learn about what we sold and get a sales-based position with that knowledge. I used my growing knowledge of tech (computers, cell phones, tablets) to earn a sales position that was partially commission-based, then leveraged my job title and growing tech knowledge to get a better-paying job elsewhere. If I’ve learned anything since college, it’s that it’s never too late to learn new skills or leverage the ones you already have to earn better job titles and make more money. These are some things I’ve learned about tech skills and how they can help. These basic skills—which seemed useful to kid-me since they let me do fun stuff to my Neopets account—actually landed me a work study job in college that paid twice as much as anything else listed on my university’s work study website. Who knew? Certainly not me. It never occurred to me until I saw the job posting that HTML and CSS skills learned on a kids’ virtual pets site could earn me so much cash in college. At the time, I also had a basic working knowledge of the Adobe Creative Suite (primarily Photoshop and InDesign) from working on my high school newspaper as an extracurricular. All of these skills, which seemed like such silly, disconnected pieces of knowledge, landed me one of the best jobs on campus editing website code and visual graphics for a renowned national media company. Have you ever edited a WordPress theme, made a simple website for a project, or fixed your photos with Photoshop (or one of these awesome alternatives)? You already have in-demand tech skills! A quick search on Indeed for “basic HTML” brings up almost 10,000 results with hourly wages in the double digits. You can start making more money with basic knowledge right now. Whether you like your current job and just want a raise or want to embark on something altogether new, it pays to constantly push yourself to learn more. If you know basic HTML and CSS, try tapping into other programming languages to create even slicker, more professional-looking websites and apps. Skillcrush Career Blueprints are a great place to start to get the skills you need. Companies are looking for smart, motivated, passionate workers who can produce great work. Keep in mind that a lot of tech skills are based on stuff you’ve been learning your whole life. Imagine taking your math skills, even if they’re rusty (you can brush up and improve with free online courses from the Khan Academy), and leveraging them to get into something like big data analysis. According to Information Week, skilled workers who can and want to handle data sets using the most up-to-date technology are in demand all across the board. a) Take a look at your company’s website. Is it user-friendly, informative, and easy on the eyes? Does it have a coherent design with a solid balance of graphics and text? Use your skills to create a mockup of an updated site that fulfills these basic needs. Present it to your boss and offer to implement your ideas to drive more site traffic and generate profit for the company. b) Draft a total social media solution that markets your company’s brand and message to target audiences. Use websites like Facebook, Twitter, Pinterest, Instagram, and even Tumblr to get the word out about a product or service. Use hashtags and keywords that are search engine optimized (see this free guide from Moz for SEO tips). c) Reduce redundancy by taking your company’s local file storage systems and making them cloud-based. Demonstrate to your boss how much easier communication and file sharing could be on cheaper, more secure cloud storage and introduce simple systems that everyone can use with easy-to-follow guidelines that even entry-level employees can navigate. Once you’ve proven your skills, negotiate new responsibilities with your boss and decide how these tasks your position in the company. Maybe you keep your current position and add to your daily to-do list. Maybe you slide into a different position or create a new one that doesn’t exist but should. Make it clear that you and your skills are necessary. Not only are you needed right now, you’re needed for the future growth and development of the company. a) Arrange a private meeting somewhere that you won’t be interrupted, where you can focus on what you have to show and what you have to say. c) Research competitive rates for your role at similar companies and be prepared to present some numbers. 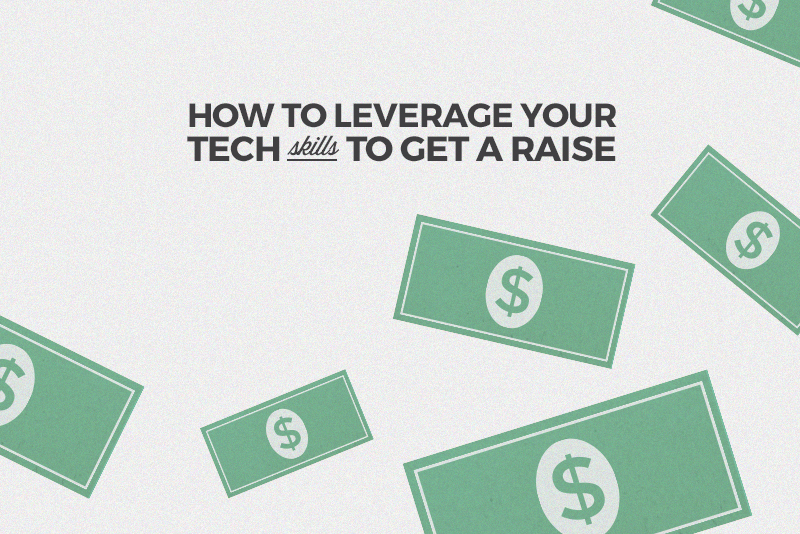 Remember: you’re asking for money to match the skills you bring to the table. Don’t let your boss lowball you because they think you haven’t done your research! d) Most importantly: be professional! Treat this meeting like both an interview and a performance review, where you’re the one demonstrating why you need to be making more money. If your boss won’t pay you what you deserve, take your skills and use them at another company, or even in another field. I know that changing careers sounds terrifying, but think about it this way: if you’re in a thankless job where your skills are underutilized and you’re being underpaid, not only are you going to be bored and unhappy, but your career and your life will also suffer. Sometimes taking the plunge and starting over is the wisest move. Remember that Indeed search for “basic HTML” that turned up thousands of results? Now check out these job listings and see how many of your tech skills fit the descriptions companies are putting in their ads. Are you surprised how many you’re totally qualified to tap into? Don’t be. Like I said earlier: you’re awesome. Show it off. Imagine you don’t want to start over somewhere new and you’ve been turned down for a raise. Surprise! You can still make more money with your tech skills: introduce a side hustle. According to a 2014 study by Freelancers Union, 53 million Americans now freelance. These freelancers are raking in money for their projects, especially if they work in tech. In 2015, Payoneer, a global payment platform, surveyed 23,000 international freelancers and discovered that the average yearly salary of a freelance worker is often more than a traditional worker, according to international averages. Freelance work can seem frightening, especially for a beginner. Don’t worry! Skillcrush has your back. Here are just a few posts to help you get started in the freelance world, like this guide for earning money even as a beginner, these tips for earning a six figure salary, and this guide to writing great freelance job proposals. Also check out this (totally free!) Ultimate Guide to Making More Money in Tech. If a side hustle seems like the best option for you, don’t be afraid to jump on it. Does your LinkedIn profile reflect your tech skills? It should. So should your paper resume, since lots of companies (especially small, local ones) still want to see who you are on paper. Make yourself seem as marketable as possible using these tips so when people view your profile, they’re as impressed as they should be. Whether you work your way up in your current company and earn a raise with your in-demand tech skills, start your career over elsewhere or introduce a few side hustles, keep your information as up-to-date and accessible as possible. You’ve got the skills you need. Display them proudly.